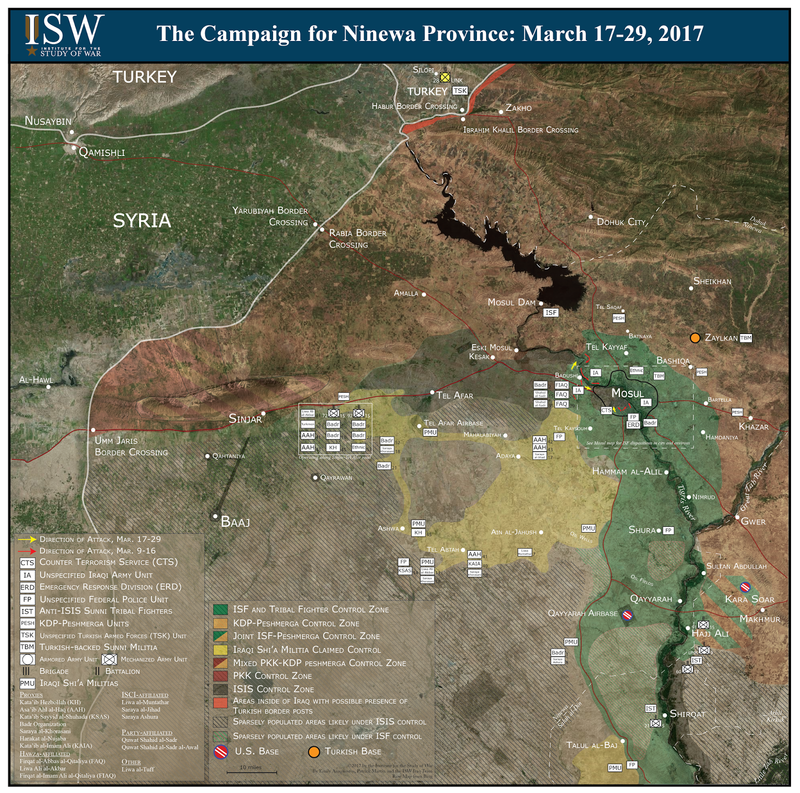 The Iraqi Security Forces (ISF) slowed its advance into western Mosul on March 26 in order to regroup and prepare for an assault on the Old City, the densest part of western Mosul in terms of both population and infrastructure. The U.S. is deploying an additional 240 soldiers to Mosul, likely to support a final push through the Old City. The ISF has also slowed its operation out of continued concerns of civilian casualties throughout the western Mosul operation. Humanitarian concerns flared when local sources claimed that a Coalition airstrike on March 17 killed as many as 200 civilians. Meanwhile, Iran is deepening the role of its proxy Badr Organization in Ninewa Province to influence the post-ISIS security and political structure in the province. The Iraqi Security Forces (ISF) slowed its offensive in central Mosul on March 26 out of concern for the estimated 400,000 civilians remaining in the Old City. The ISF continues operations in the outer neighborhoods, but has largely paused the offensive into the Old City. Local sources claimed that a Coalition airstrike on March 17 killed as many as 200 civilians in the adjacent New Mosul neighborhood. The Coalition confirmed that it conducted a strike in the area on March 17, however the strike may have set off ISIS VBIEDs or rigged houses near the strike, which caused the bulk of casualties. U.S. officials insisted that the Trump Administration has not loosened the rules of engagement for airstrikes. The Obama Administration in December 2016 had allowed Coalition advisors on the ground to directly call in airstrikes in order to improve precision. International human rights groups have criticized the Coalition for not making sufficient effort to prevent civilian casualties, however. A UN official stated that at least 307 civilians have died in western Mosul so far, the majority in the March 17 airstrike. ISIS is deliberately complicating the Coalition’s ability to conduct airstrikes by using the civilian population as human shields. The ISF is opening a second front to isolate the Old City, rather than working through it, in order to maintain pressure on ISIS and avoid civilian casualties. Units are advancing along the Old City’s western edge towards the Great Mosque, which they will likely seek to retake before turning inward. The ISF could also increase pressure on ISIS by positioning the 9th IA Division, which completed the recapture of Badush Sub-District on March 26, to breach Mosul from the northwest. U.S. officials announced on March 27th the deployment of 240 additional troops from the U.S. Army’s 82nd Airborne Division, likely in order to accelerate the defeat of ISIS in Mosul. The troops have likely already arrived. This deployment is not likely a response to the March 17 airstrike, as the force is tasked with force protection and IED clearance, but it could still further enable airstrike precision. Iraqi political backlash against the March 17 airstrike could slow or constrain Coalition efforts, however. Sunni political leader Osama al-Nujaifi called for an “immediate end” to airstrikes in Mosul on March 24. 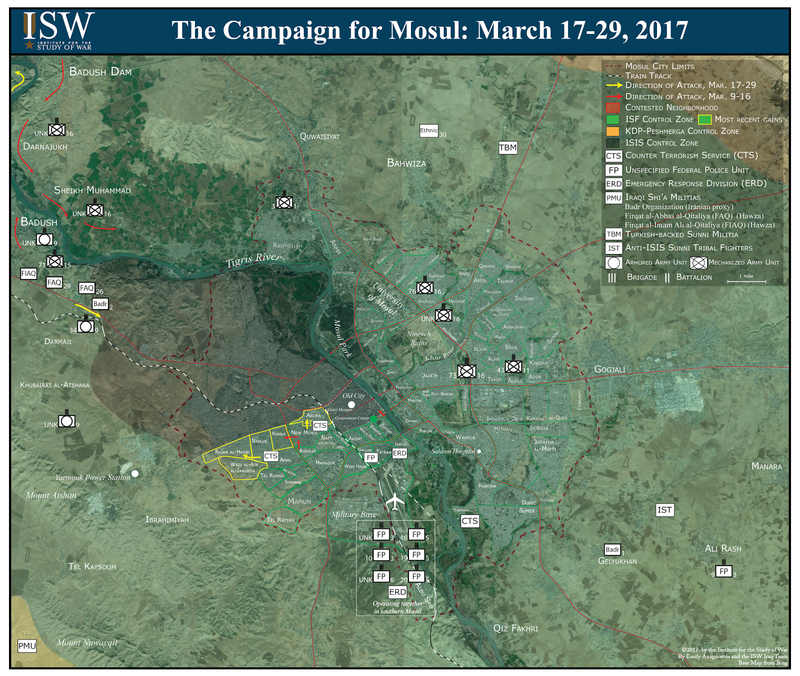 A reduction in Coalition airpower in Mosul would increase the risk to ISF and U.S. forces by making them more vulnerable to ISIS tactics such as SVBIEDs. Meanwhile, Iranian proxies in the Ministry of Interior and the Badr Organization have increased Iran’s influence in the Mosul operation. The ISF’s official media outlet listed the 2nd Badr Brigade’s operations together with the 9th IA Division northeast of Mosul city on March 22, suggesting a growing interoperability between the Popular Mobilization and the Iraqi Army. Coalition advisors are currently supporting the 9th IA Division. The Popular Mobilization entered Mosul’s city limits as part of a humanitarian campaign which it launched on March 14. Aid convoys entered recaptured western neighborhoods soon after, bearing the flags of the Badr Organization and Liwa Ali al-Akbar, a Hawza affiliated militia. Unidentified armed forces, likely Badr, accompanied the convoys. The Ministry of Interior, an Iranian client, appointed Abu Dargham al-Maturi as commander of the 6th Federal Police Division, a new unit that made its operational debut at the start of the western Mosul operation on February 19. Abu Dargham is also the commander of a Badr Organization’s brigade and has used his dual role to permit entry to proxy militias into off-limit operations. His appointment to the division underscores the risk of further Iranian infiltration into the ISF and inside Mosul. The Badr Organization will continue to expand Iranian influence in Mosul after its recapture. It is already working to establish a political presence in northern Iraq. It may also try to coopt local tribal militias, currently acting as hold forces, as it did in Salah al-Din by financially supporting a tribal militia as part of the Popular Mobilization in early 2016. The Badr-controlled Ministry of Interior will likewise ensure that the Mosul Police Chief remains friendly to the central government and amenable to Iranian interests. The U.S. must ensure that the post-ISIS holding force in Mosul City is both controlled by the Iraqi government and responsive to its authority. The U.S. must contain and reduce Iran’s influence in Mosul. The Badr Organization’s direct presence in Mosul city and its environs places American service members at risk. Its continued presence in Mosul could also could drive sectarian tensions that ISIS or other insurgent groups could use to recruit, undermining the success of anti-ISIS operations.